Marguerite (Lofft) de Angeli (1889-1987) – American author and illustrator of children’s books. 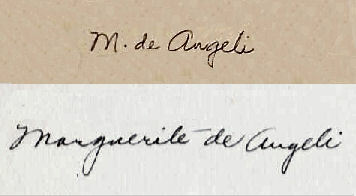 Marguerite de Angeli began her career in 1906 as a concert and church soloist. Following her marriage in 1910 and the birth of several children, she turned from singing to studying drawing, and began illustrating articles for Country Gentleman, Ladies Home Journal, and others. By 1934 she was illustrating stories she herself had written and soon became one of America’s most popular writer and illustrator of children’s books. de Angeli was admired particularly for her pioneering stories about minorities and for her historical fiction about the Middle Ages. She has won several awards for her distinguished and lasting contribution to the world of children’s books, including a Newbery Medal (The Door in the Wall, a historical novel set in medieval England), a Newbery Honor Book Award, Caldecott Honor Book Award (twice), a Lewis Carrol Shelf Award, and the 1968 Regina Medal. Her manuscripts and letters are housed at the Free Library in Philadelphia.